It was a deal that changed Yankee franchise history. Two weeks before Christmas in 1959 the Yankees sent Hank Bauer, Don Larsen, Norm Siebern and Marvelous Marv Throneberry to Kansas City for Roger Maris, Joe DeMaestri and today’s Pinstripe Birthday Celebrant. All three of the players New York received in that deal had started for Kansas City during the 1959 season, but only Maris would start once they got to the Bronx. In fact, the Rajah’s unbelievable success during his first two years in the Big Apple, which included two straight AL MVP Awards and baseball’s single season home run record completely obscured Kent Hadleys short time in pinstripes. After a great collegiate career at USC, the native of Pocatello, Idaho had been signed by the Tigers and spent the next two years playing in Detroit’s farm system. In November of 1957, he was one of thirteen players involved in a swap between Detroit and the A’s. Two years later, he looked like he was becoming a solid big league hitter, popping ten home runs for KC and growing more confident with each at bat. That all ended with the move to New York. With an All Star named Moose Skowren playing first base in front of him, Hadley got just 70 at bats in 1960 and was left off the Yankees’ postseason roster. Still, he hit four home runs that year and during an afternoon in late June, gave Bronx Bomber fans a hint of what might have been if there was room for his left handed bat in that incredible Yankee lineup. New York was playing Detroit in MoTown and Casey Stengel gave Hadley a rare start at first. Batting sixth behind Yogi Berra, the kid hit two bombs off Tiger right-hander Paul Foytack. leading New York to a 7-3 victory. Released by the Yanks after the 1960 season, he played a year in the White Sox farm system before becoming one of the early US-born baseball playing pioneers to go to Japan. During the next six years he hit 131 home runs for the Nankai Hawks and became a fan favorite. When his playing days were over, Hadley returned to Pocatello, where he started a successful insurance business. He passed away there in 2005 at the age of 70. He shares his birthday with this former Yankee outfielder, this former Yankee starting pitcher and this other one too. Probably like most pretty passionate baseball fans, when I see the name “Bob Ojeda,” two things come to mind quickly. The first is that 1986 Met season when today’s birthday celebrant was the very best pitcher in the outstanding starting rotation of that World Championship team. The second is the tragic Florida boating accident that took place during the Cleveland Indians’ 1993 spring training season, in which Ojeda was seriously injured and two of his Cleveland teammates, Steve Olin and Tim Crews, lost their lives. What most of us forget, when we come across the name of this talented left-hander who pitched in the big leagues for all or parts of 15 seasons, is that he finished that career in pinstripes. Ojeda was able to recover from the injuries he suffered in that boating accident and actually pitch for Cleveland during the final two months of the 1993 season, but was then released. The Yankees had just finished a strong ’93 season in second place in the AL East under second-year manager Buck Showalter and felt they were one starting pitcher away from being a post season participant in 1994. When Yankee GM Gene Michael couldn’t make a trade for that starter, he decided to throw the role up for open competition during New York’s ’94 spring training camp. Participants in that competition included the team’s top prospects at the time, Sterling Hitchcock and Mark Hutton and the veteran Ojeda, who Michael had signed to a one-year minor league deal. Ojeda ended up pitching better in that exhibition season than not only both youngsters, but also Scott Kamieniecki, who had been the fifth starter in New York’s ’93 rotation. It was decided that Kamieniecki would start the year in the bullpen and Ojeda would go to Triple A Columbus for a few practice starts to strengthen his arm before joining the Yankee starting rotation. He made his first start for his new team on April 16th of that season in a game against the Tigers in Detroit and was hammered hard, not surviving the first inning. He got his second chance a week later, this time at the Stadium, versus Oakland and was hammered again, not making it out of the third inning. He did not get a third chance. Michael and Showalter decided they were better off starting Kamieniecki and they released Ojeda. A few months ago, Ojeda wrote one of the best self-retrospective articles I’ve ever read written by a professional athlete. It appeared in a May 2012 edition of the New York Times and you can read it here. In it he reveals that his left arm has been chronically sore since he was a 12-year-old little league pitcher and only a constant mixture of drugs, ice, booze and denial throughout his career kept him pitching. Ojeda shares his birthday with this former Yankee starting pitcher, this one too and this former Yankee outfielder. 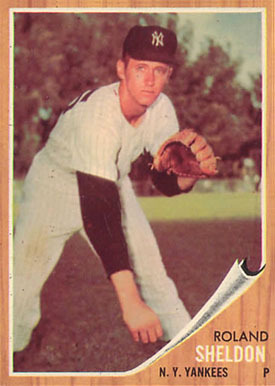 I have a Roland Sheldon 1962 baseball card like the one pictured here. As you can see, he looks like a high school kid in a Yankee uniform. On the back of this card, it lists Sheldon’s date of birth as December 17, 1936, which means he would have been 24 years old during his 1961 rookie season with New York. That year he went 11-5 as the fifth starter on one of the greatest teams in the history of the franchise. He sure as heck doesn’t look 24 years old in his picture on this baseball card. That’s why I was pretty shocked when I came across an old newspaper article in which it was reported that some of Sheldon’s old classmates from his Putnam, CT high school claimed he lied about his age. According to them, Sheldon was born in 1932 which meant he would have been 28 years old during that rookie season. In any event, Rollie spent a little bit more than three seasons with the Yankees and won 23 of 38 decisions. He was traded to Kansas City in 1964. He retired after the 1966 season. So happy 75th or 79th birthday, Rollie. Rollie shares his birthday with this former Yankee outfielder, this one-time Yankee first baseman and this former Yankee and Met pitcher. I’m sharing this with you as part of today’s Pinstripe Birthday Blog post because I still remember the first time I saw today’s birthday celebrant play a game in a Yankee uniform, even though it happened over nine years ago and he ended up appearing in just four games in pinstripes. There’s three reasons for my ability to still recollect such a nondescript Yankee and the first one is my Dad. One of his all-time favorite country & western shaving tunes was called “Kiss an Angel Good Morning.” It was sung by Charley Pride, who was a huge C&W recording artist during the 1970s and one of the greatest Texas Ranger fans in the history of that franchise. So when I heard Curtis Pride’s name mentioned the first time during that 2003 televised Yankee/Red Sox contest, I immediately associated him with Charley Pride, which immediately made me picture my Dad singing the tune “Kiss an Angel Good Morning” while shaving in front of the steamed up mirror of his medicine cabinet. The second reason I still remember Pride’s first Yankee game was because during his first at bat, the game announcers revealed that he had been born deaf. After attending special schools until the seventh grade, Curtis’s parents insisted he go to regular schools and learn how to survive in the mainstream world with his handicap. Pride was up to the task and he also developed into a superb athlete, attending William & Mary on a basketball scholarship, while also playing minor league baseball. He broke into the big leagues with the Expos in 1993, was released by Montreal in ’95 and was then signed by the Tigers. During the next two seasons he saw more playing time with Detroit than he would see with any of the other five teams he played with during his 11 years as a big leaguer. The Yankees signed him in May of that 2003 season and sent him to their Triple A farm team in Columbus. That July, Yankee outfielders Bernie Williams and Raul Mondesi both went down with injuries and Pride was called up to the Bronx as a temporary replacement just in time for a four game series with the Red Sox. New York had started that series with a four game lead in the AL East over second-place Boston. That lead had been cut in half after Boston had won the first two games. New York was leading the third game 3-1 when Pride led off the top of the sixth and gave me my third reason for remembering his debut. He hit a long home run over the old Yankee Stadium’s center field wall off of Boston right-hander John Burkett and the Stadium went wild, standing and cheering as Pride circled the bases. At the urging of Manager Joe Torre, Pride emerged from the dugout for a curtain call and you could see tears coming down his cheek when he tipped his cap to the cheering fans. He later admitted he couldn’t hear the crowd’s cheers. The next afternoon, Pride came to the plate in the bottom of the ninth inning of a 1-1 game with the bases loaded and one out and hit a ground ball to Red Sox second baseman, Todd Walker. Walker bobbled the ball, eliminating his chance to turn it into a game-ending double play. His throw to the plate sailed over the head of Jason Varitek, allowing Hideki Matsui to score the winning run. Pride was mobbed by his Yankee teammates as the Stadium once again went wild with cheers that Pride could not hear. Curtis Pride would appear in just two more games for New York before he was sent back to Columbus in late July to make room on the Yankee roster for reliever Jesse Orosco. He would catch on with the Angels in 2004 and play portions of three more big league seasons. 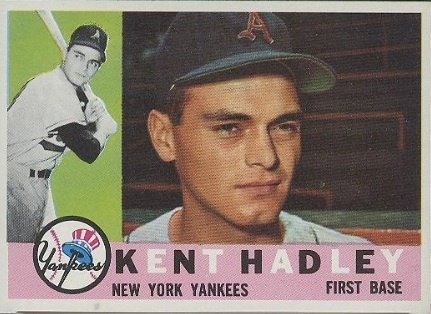 Pride shares his birthday with this one-time first baseman, this former Yankee starting pitcher and this other one too.